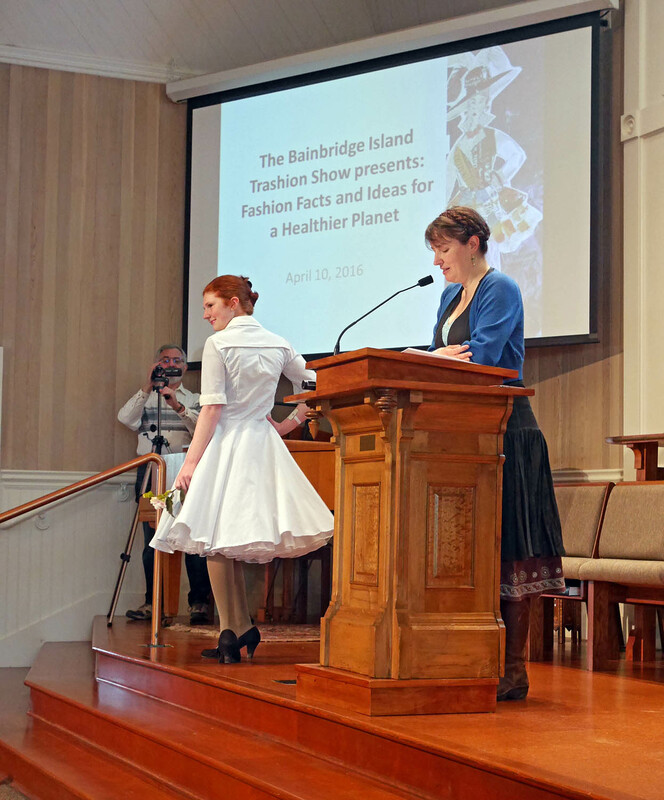 Bainbridge Island’s first Trashion Show was a huge success! We had a sold out crowd and over twenty fashions modeled, as well as three fashions made in 15 minutes during the audience participation event. Every fashion modeled at the show was fabulous and it was incredibly hard to pick the best as our three judges attested to. Naomi Spinak, Deb Rudnick and Diane Landry, the organizing team. Zero Waste members for delicious food and refreshments. All our sponsors and contributors who provided prizes and helped support the event: Meli Melo Vintage Boutique, Sash Mercantile, Cotton and Cashmere, Lollipops Children’s Boutique, Bon Bon Confections, and Grounds for Change coffee. Rebecca Rockefeller, emcee, and co-founder of Buy Nothing Bainbridge. Reed Price, sound and lighting. Judges: Alli Schuchman, Greg Millican, and Bhama Roget. And of course, all the designers and models! (see below). Americans buy 20 billion new items of clothing and send 12 million tons of textiles to the landfill every year (2012 figures). It takes more than 700 gallons of water to produce a single cotton t-shirt. It takes up to 2,900 gallons of water to produce a pair of jeans. The average pair of jeans produces about 900 lbs of CO2 over its lifespan. 60% of this is in the production; 40% is in the use and disposal of the garment. 95% of textiles are recyclable; only 15% of textiles in the US are recycled. You can make a difference! You have control over half the carbon footprint of your clothes. Buy used clothing. Wear your clothing out. Buy quality products that last a long time. Use cold water to wash, and wash only when needed. Swap clothes on Buy Nothing Bainbridge. In the first half of the show, designers were asked to create or coordinate clothing that could be worn on the street or to work, but were secondhand or created from repurposed or upcycled materials. Fashioned from two Goodwill T-shirts – She challenges herself when making these dresses to utilize as much of the available original fabric as possible, including the smallest of scraps. In this case fabric remnants were used as “collage” pieces, creating lines and spirals. These were then sewn on to the basic garment, much like painting on fabric, to add another layer of color and texture. The magic of cotton t-shirt fabric allows easy cutting and stitching without raveling, and there is an added bonus of the unpredictable curling that results after washing and drying the dress! This mid-century inspired dress was made using two very worn flat bedsheets given to Michelle by a 100 year old woman. The pattern used to construct this garment was hacked from a paper pattern and a self drafted circle skirt.The front of the bodice has bold couch piping covered with a piece of white sheet. Carson is wearing this with a vintage crinoline. Wrist cuffs were made by decoupaging old book pages on toilet paper tubes. 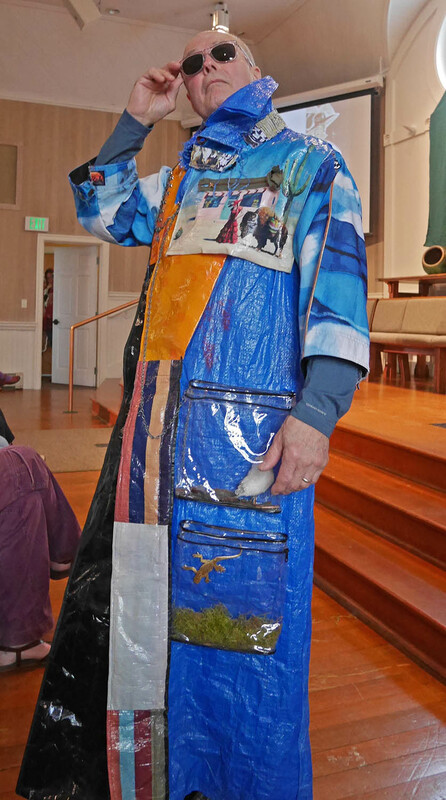 The jacket outer shell, in this ensemble, was made by cutting open 4 tyvek mailers, and painting them using bronze paint. It is lined with a very soft flannel bed sheet. The neckline was made using the cuffs off of an old sweatshirt. The peplum dress was constructed from 2 old white t-shirts, that were put into a blue dyebath. Mirit is also wearing a headband made from the scraps of those t-shirts. It is modeled by student Mirit Spinak. Here is the story of Jeanne’s sweater: She purchased a turtleneck sweater at a thrift shop, then cut it down from the collar, crocheted an edge to keep it from raveling and then let it sit, and sit, and sit. Then one day she got a bag of miscellaneous vintage linens and voila: there was the tablecloth with the gorgeous crocheted edge, but it was all quite deteriorated, so she carefully, stitch-by-stitch, separated the edging, repaired it with some old crochet thread she already had, and this was the result.” Jeanne is wearing the sweater with her own skirt. 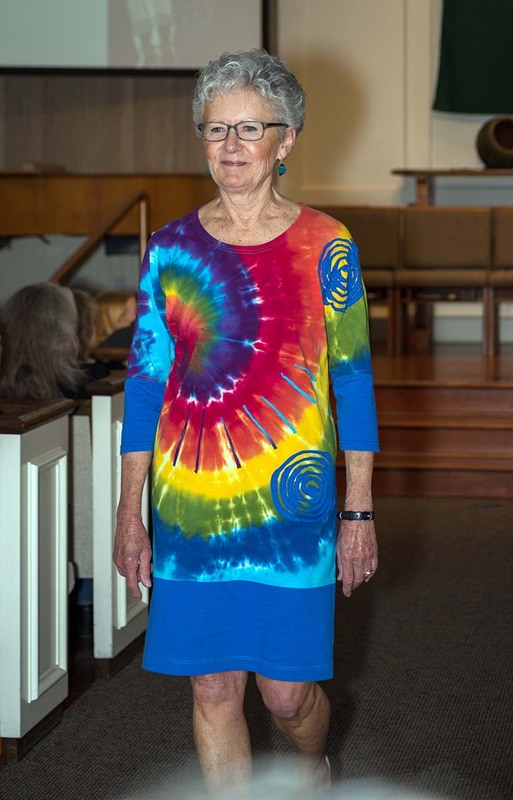 This model, science educator Sharon Katz Cooper, is wearing a cotton long sleeve shirt purchased from Children’s Hospital Thrift Store. Her sweater is recycled overdyed cashmere knit from a yarn by Raveling Rose with additional leftover yarn from the designer’s yarn stash. The skirt is made from a book of upholstery samples from Esther’s Fabric store and a pair of worn wool men’s trousers-which also provided the zipper. The lining is leftovers from Children’s hospital thrift. The hat is made from mailing cardboard and a bubble wrap envelope covered with the same pair of trousers and upholstery sample trim. A ripped t shirt, twist ties, a broken zipper, vintage buttons and mesh vegetable bags complete the hat. Her bracelet is made from vintage buttons and a charger cord and her earrings are bag ties. Cotton + Cashmere has submitted a lightly-worn spring outfit that one could wear to the Kentucky Derby without batting an eye and it includes a fabulous black straw hat! 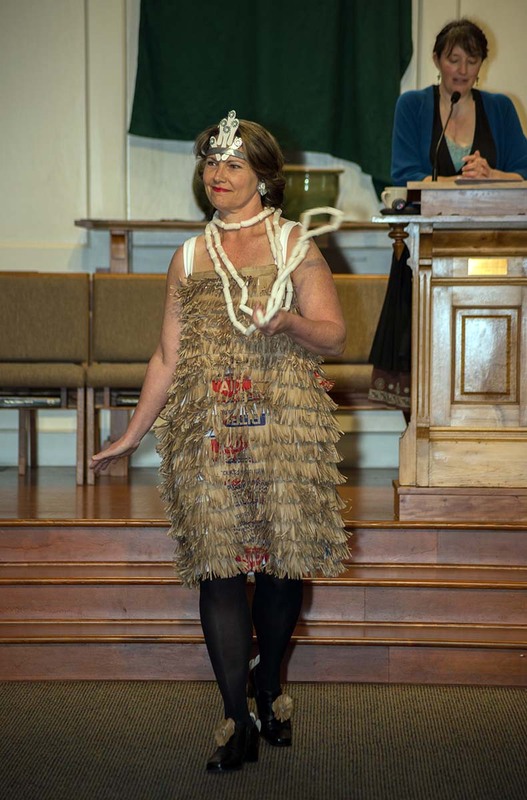 It is modeled by artist and creative consultant Jennifer Manlowe. Lollipops Children’s Boutique Karin Lehotsky shared this next ensemble with us. Sivan, a local student, is wearing a Fun White Ruffle dress with black patent Self Esteem flats from Lollipop Children’s Boutique consignment section. They are paired with her own leggings. 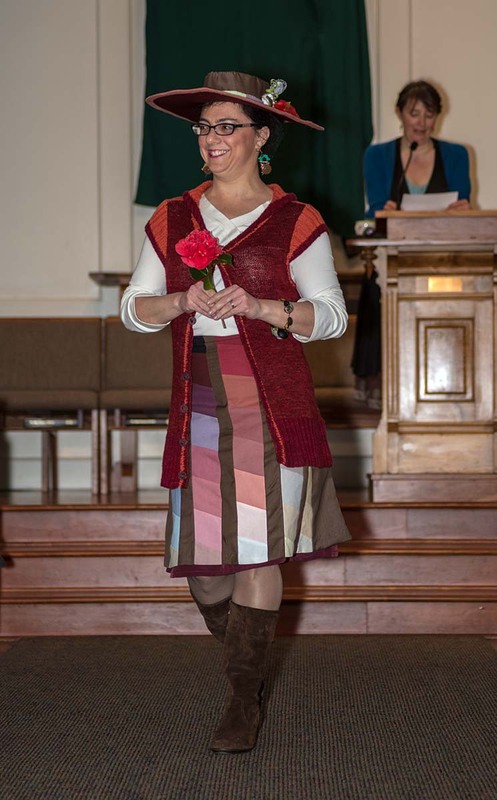 Great friends, Peggy and Sally, from Sash Mercantile, collaborated on this wildly colorful frock. Peggy found the base of the dress without a zipper, the cut out flowers came from a discarded blazer and a ripped skirt. The petticoat was made from sheer curtain panels. Other embellishments were harvested from crocheted doilies, a sequined dress, fresh flowers, vintage trim, fabric scraps, buttons and jewelry. It is modeled by Sally Kuhn. 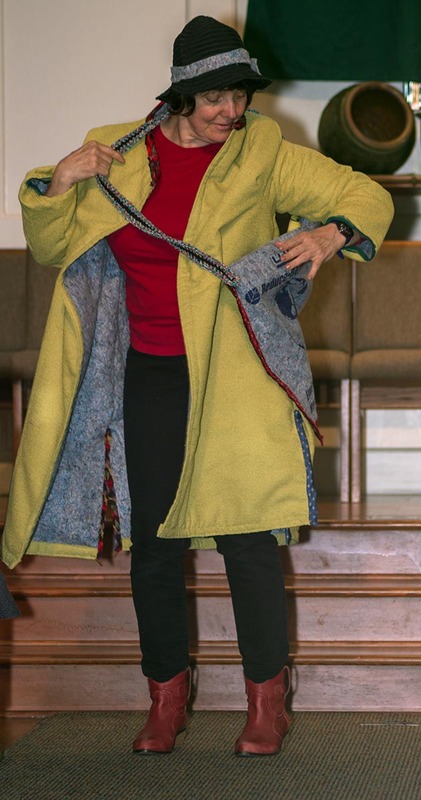 Therese Kunzi Clark is showing off her reversible jacket. It is created from UPS blankets which were made from old jeans and accented with silk ties. Fashioned from two separate Goodwill jackets – one a corduroy jean jacket and another “ladies who lunch” semi-designer lined jacket. Her personal rule is to only use items that I can machine wash and dry, and this woven fabric really surprised her with its resilience. Her goal was to maintain the basic idea of the jean jacket with its sturdy metal zipper, but the body and sleeves were too short and there were no useful pockets. 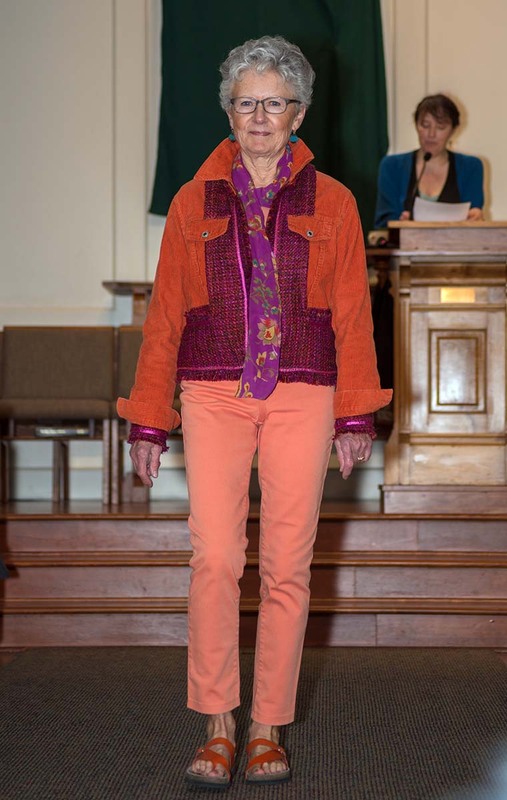 She pieced together parts of each jacket, working around the existing details and making use of the great color combinations. She also found enough remaining bits and pieces of the fancy lining to piece together into a scarf. And it’s totally wash and dryable! She is wearing the jacket with her own jeans. 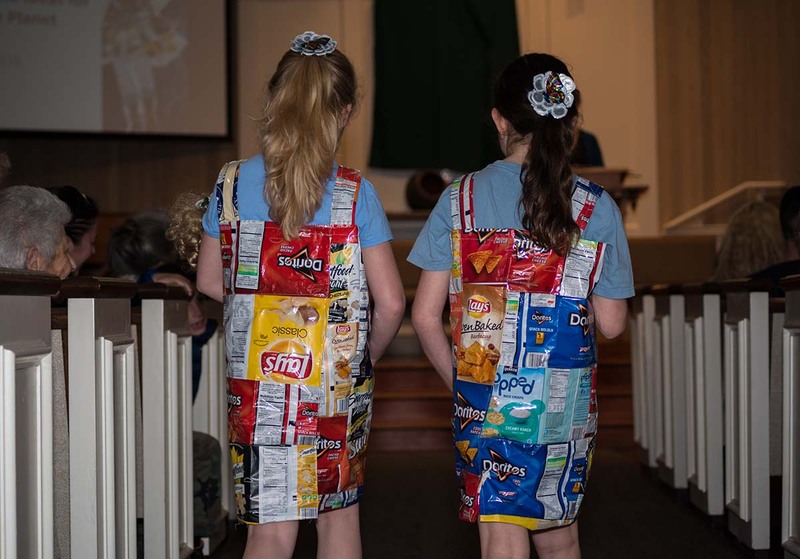 In the second half of the show, designs are high fashion lower function, not typically seen around town, but highlight the use of unusual materials rescued from the trash to create fantastic ensembles. This fun ensemble takes an old t shirt new places and shows that packing materials can think out of the box. Trash bags and fabric scraps complete the look. It is worn with the models own jeans. 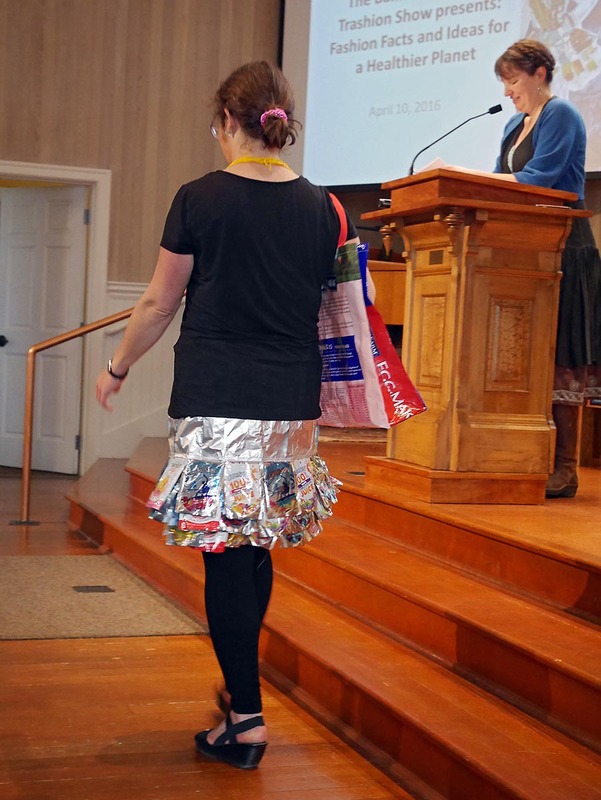 Deb Rudnick fashioned this glamorous skirt from caprisun drink bags and lined it with a bedsheet. Her thrift store top is accented with a necklace made from the drinking straws which accompanied the bags. Angeline is wearing a paper shift top created from the pages of a discarded school reading book for elementary students. The pages were sewn together by machine with a small strip of recycled felt behind the seams. Metal brads are used to fasten the shoulders and the one side. Her skirt originated as a pillowcase which was from the Rotary sale last summer. 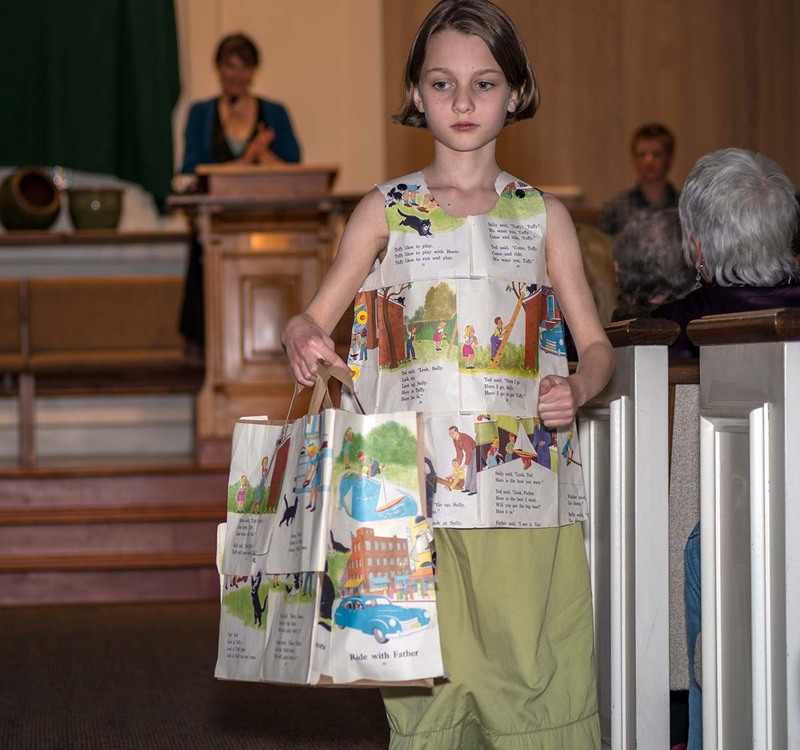 Angeline is carrying a bag she designed with the remaining book pages. Hazel wore a denim jumper dress created from pant legs embellished with antique linens. Extra buttons from a fancy dress are placed as decoration at the shoulders which snap together. The ruffle previously was a kitchen curtain valance. Hazel created her hair accessory from a scrap of the linens. The outer shell of the corset is constructed entirely from used Capri Sun juice pouches. The pouches were collected from school lunches, and stitched together to make this corset shine like armor. It is lined using weed barrier cloth, and laced in the back using a ribbon. The boning is made from zip ties. The skirt is one large piece of egg carton packing foam that was splatter painted, and then cut into a circle skirt, and sewn with an elastic waist. Adornments were all made out of foam shelf liner. Carson’s hair feathers are made from wire and book pages. Julia White modeled School Lunch. 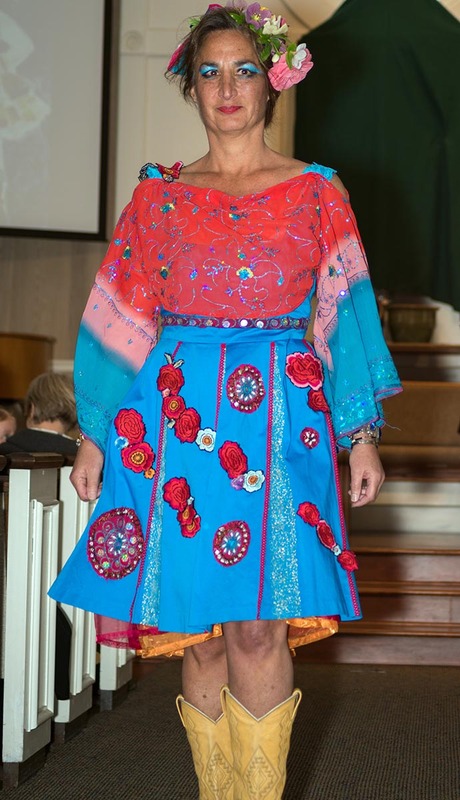 the outfit is created from a Children’s Hospital Thrift dress that has been overdyed and fitted with a dead stock zipper, and completely studded with plastic bottlecaps attached with fabric scraps. It is attached to a cereal bag puffed skirt complete with mesh bags, bottle caps, corks, fabric scraps, and bubble wrap. Her trousers are created from many pairs of ripped jeans and accented with vintage linens. She is also wearing secondhand cowboy boots. Roni Katz Cooper modeled Little Monster/Mother’s Little Helper. The body of the jacket is made from denim from Children’s Hospital Thrift Store and beaded with corks from a variety of island parents. They are attached with recycled wool yarn. The sleeves are made from bicycle tubes. The jacket is lined with swimsuits that were no longer suitable for swimming. The jacket is finished with a felted wool sweater. 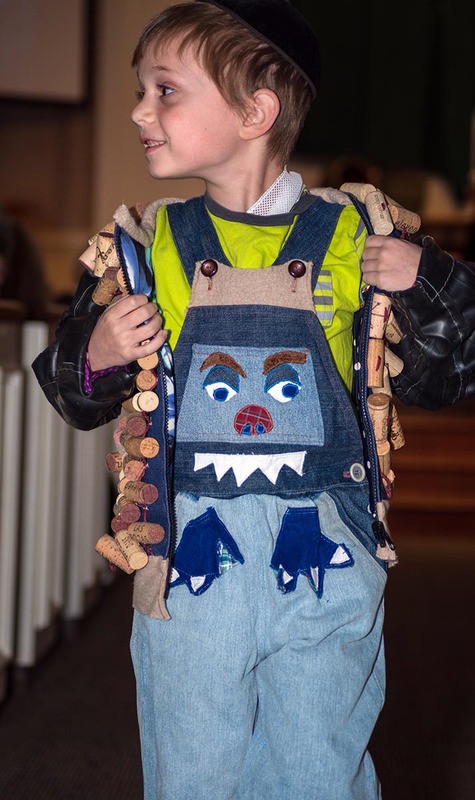 The monster overalls are made from upcycled jeans and fabric scraps including that same felted wool sweater. His Converse sneakers come from the online consignment shop Thred Up. Deb Rudnick created these colorful dresses with her daughter Hannah and Hannah’s friend Isabelle. Their dolls came along for the fun. Both girls have hair pieces made from contact-lens pouches, mylar balloon and an apple sauce top. The doll’s outfits are pasta bags. 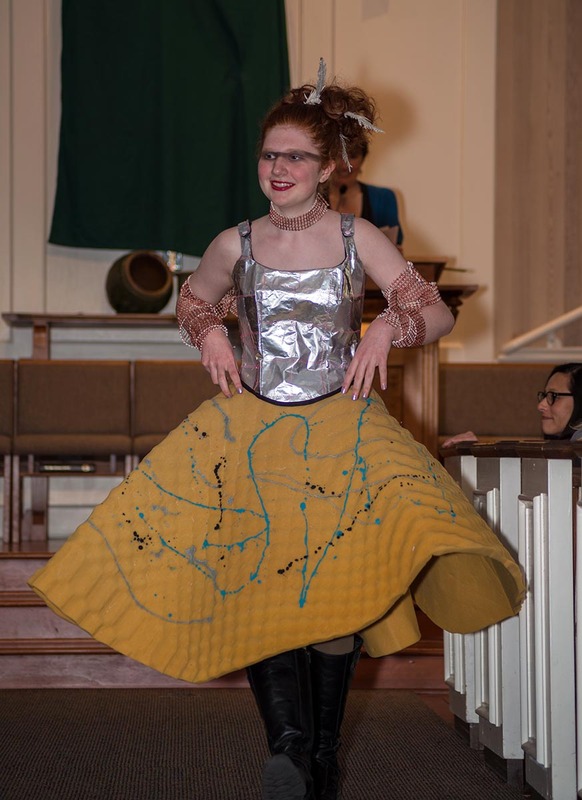 This is an inspired recycled paper dress, modeled by Kimberly Bond. Madame Secretary is a Secretary Bird who is dressed in Betsey Johnson couture. Sue chose to make a bird to bring awareness this Earth Day to the birds who are losing their habitats and food sources due to over building and climate change. Madame Secretary’s ensemble is made entirely of paper, primarily magazines. 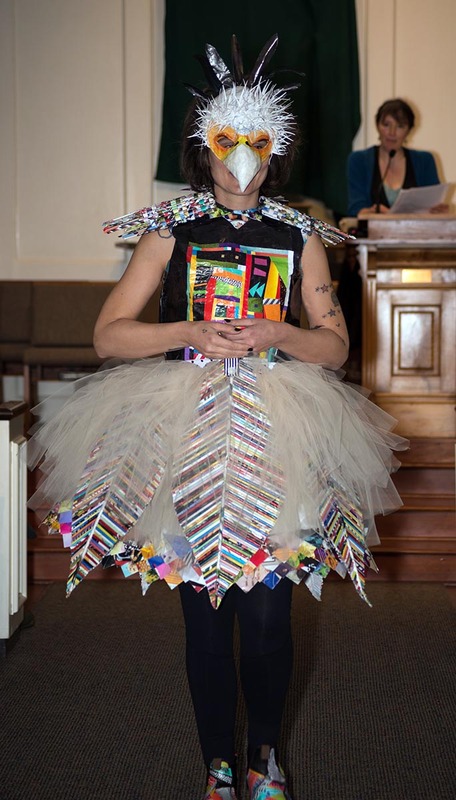 The completed ensemble used more than 1000 pages from recycled magazines garnered from the library and friends. Sue used this couture as a challenge to explore different techniques that could be used to create with paper. The Mask was made from paper mache. Sue used a Halloweeen half mask, wadded recycled newsprint and butcher paper to create the bird’s head and beak. She used watercolor pencils and cut paper for the feathers and features. The Top Kimberly is wearing has been collaged using Modern Quilt designs and cut paper from magazines. It is trimmed by folded magazine pages which were sewn by machine. The collar was created with layered triangles using an origami folding technique.The layered triangles on the Skirt use the same technique. Sue chose this technique because she thought the folded triangles gave it a 3-Dimensional quality and created an overall feathered look. You can’t have Betsey Johnson couture without having layers of tulle. The Tulle Tutu in this piece is used over the skirt to create a buoyancy for the the 5 large feathers. These were created using rolled paper tubes. Sue rolled more than 500 magazine pages to create the tubes needed to make these feathers. The Epaulets also used rolled paper tubes that have been woven. The tight weave made them curve naturally to fit the shoulder. This couture would not be a Betsey Johnson creation without some wild and crazy Boots. 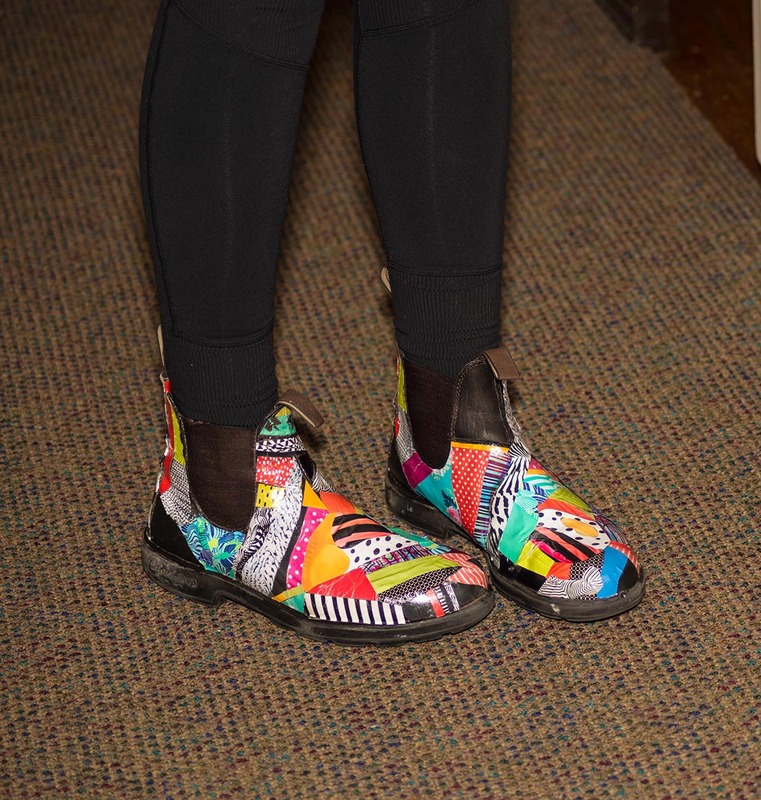 Sue collaged some old boots of Kimberly’s using black and white prints and bright colored papers from exercise clothing catalogs. Jewelry and adornments were created with any leftover materials from the project. Peggy Fish and Joyce Mycka-Stettler created this coat Raindrops for model David Stettler. Raindrops was inspired by a need to address the state of our global weather crisis. This surfer dude raincoat is constructed of several double recycled materials. The tarpaulin and grocery bags, useful in their former incarnations, started out as plastic bottles. The back and collar details as well as the sleeves are constructed of recycled surfer shorts. The pockets, in their former life, were packaging for bed linens. The metal studs-old upholstery tacks, held in place by pieces of worn out erasers. The fob-like chain operated a window in its former life and the pocket details, created with found objects, represent the urgent need to appreciate and preserve wildlife. 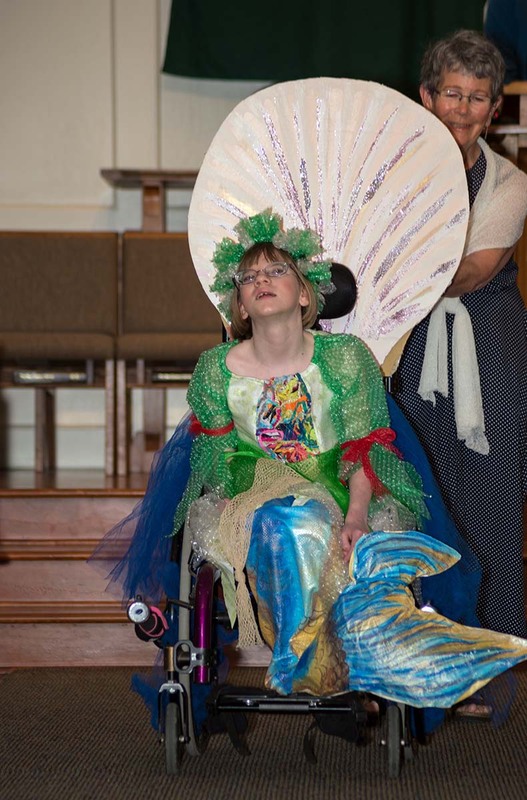 This little Mermaid’s dress is made using green and clear bubble wrap sheets. It has an elastic neckline. The bodice front was made by stitching colorful scraps of fabric to the center panel. Produce netting is stitched into the skirt portion of the dress. Hunter’s tail was made from plastic woven feed bags collected from our local feed store, and sewn into this self-drafted mermaid tail. The end of the tail is stuffed with plastic grocery bags. The entire thing is painted with acrylic paint. 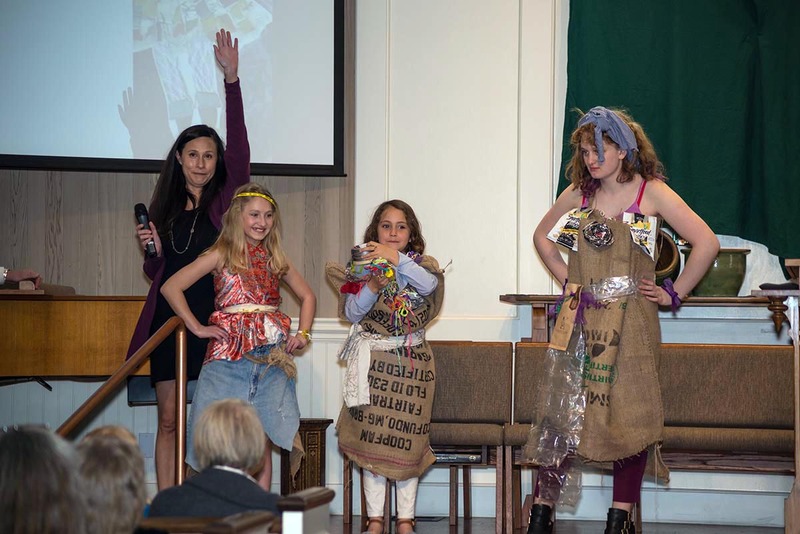 At the end of the show, Shannon Dowling ran the audience participation event: a trashion-off during which six intrepid audience members had 15 minutes to design and create three trashion fashions. The results were really fun, creative, and impressive given the short amount of time and the box of weird things each team had to work with. Thank you so much to everyone who participated and to Shannon for doing such a great job!